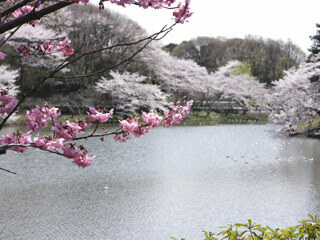 Mitsuike Park (三ッ池公園, mitsuikekouen) is the one of the 100 best Hanami spots in Japan. Mitusike means three ponds. In this park, there are 78 kinds 1,600 sakura. This park is also chosen as best 50 Bird watching place in Kanagawa. So, many wild birds live in this ponds. One of the best bird watching place nearby Tokyo. Many people enjoy hanami in Spring. The park has base ball field, tennis courts, and pool. Mitsuike Park has not only ponds but also the park is located on many small mountains. So, there are many short hiking courses with beautiful tress and flowers. Mitsuike Park is also used for the International Exchange Programs especially between China. There is Chinese nice statue, and Keran garden which both given by those countries. Mitsuike Park has nice park center building for all visitors. It has exhibition space, gallery, and lecture hall. One of the best place to visit with your families and see great Sakura.